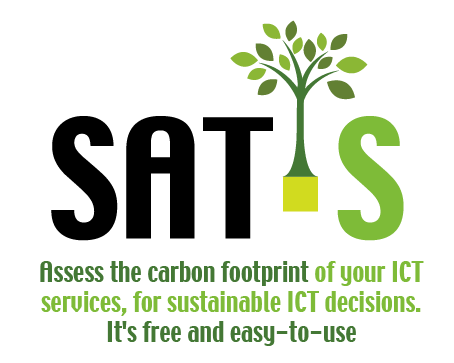 SAT-S is a free and simplified Self-Assessment Tool for ICT Services. SAT-S allows you to estimate the carbon and energy footprint of web-based digital services, such as the ones involving end-user devices and transmission networks to data centers. ICT private and public organisations (Large, Small & Medium Enterprises) and Public Administrators, that want to better understand the carbon footprint of their ICT services. Why should I use SAT-S? To get a personalised report, with a light reading style, that shows the approximate climate change and primary energy footprint of the ICT service you assessed over one year. The report also suggests actions to improve your ICT environmental impact. How long does it take to use SAT-S? 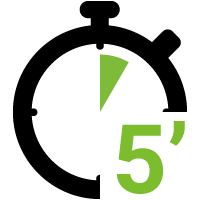 In only 5 minutes, you will get a personalised report and useful insights about your ICT service. What kind of services can I assess? Standard Web browsing, Music and Video Streaming, Video conferencing, Webinars and other types of ICT Services. How can I use SAT-S? STEP 3 – Choose the ICT service you want to assess and describe the usage within your organisation. STEP 4 – Download your take-away. Read your Customised Report. Understand the primary energy consumption and climate impact of using the service you selected, for one year. The Self-Assessment Tool for ICT Services (SAT-S) is a simplified calculator that allows you to estimate the carbon and energy footprint of web-based digital services (e.g. web-based services involving end user devices, transmission networks and datacentres). The main objective is to raise awareness on the potential impacts and main environmental hotspots of digital services. The SAT-S is also a practical introduction to quantitative environmental evaluation methods (in general and applicable to ICT services). A comparison of environmental impacts of two services providing the exact same function (e.g. a “standard’ service and an ecodesigned version of the service). Conduct a robust and exhaustive environmental assessment of an ICT service. The results are not strictly compliant with one existing standard and cannot be used for eco-design or external communication purposes; rather SAT-S leverages on several calculation methodologies in order to allow a quick assessment for the unexperienced user. Finally, the SAT-S will provide you with a personalised report that shows the approximate climate change and primary energy footprint of the ICT service you wanted to assess over one year and the rough positioning of your performances with respect to other users and common life situations.